The first antibiotic, Penicillin, was discovered by a well-known scientist Sir Alexander Fleming in 1928. Since then, antibiotics became hugely popular and the preferred drugs because of their ability to cure life-threatening diseases like tuberculosis and even treat milder ailments. Antibiotics are generally known to work against infections caused by bacteria, fungi, and certain parasites, but not against viruses. Today, antibiotics are being used for almost every kind of illness. 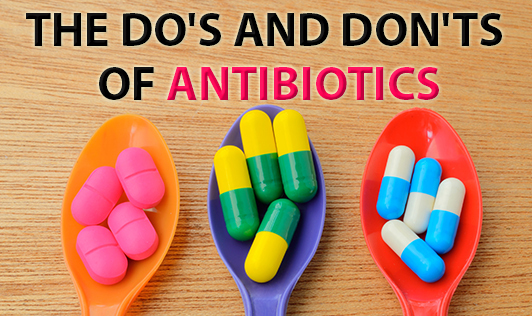 And, with the widespread usage, antibiotic resistance has also become common, which is why it becomes necessary to follow certain norms while using antibiotics. Always follow the prescription given by your physician. Some medications are required to be taken before or after food, while some others need to be taken on an empty stomach. Take the dosages as prescribed and complete your full course even if you start feeling better much earlier. Finishing a course can effectively destroy the infection, and the bacteria causing it. Inform your doctor if you are taking any other medications. Ask when you might start feeling better and the side effects that may occur. Some common side-effects of antibiotics include stomach upset, diarrhea, abdominal pain, vomiting, white patches on the tongue, allergies like swelling of lips, face or tongue, and fainting. Always inform your physician about allergies to antibiotics you have experienced in the past, so that he/she could prescribe a different course for you this time around. Store your pills at the right temperature. The package usually carries storage instructions too. Some antibiotics may have to be stored in the refrigerator at times. Never share your antibiotics with other family members or friends, even if they present the same symptoms as you. Never ignore any unexpected side effects that may occur. Always inform your physician about it. Never take antibiotics without a doctor's prescription.